12:59:00 PM not every creature will be tameable, and i presonally think that since the CU patch it's made it alot easier take down creatures, and yea, they should make the loot alot better on big kills. 11:26:00 AM Probobly from the Test Center server or something, or it could have been an event. 3:59:00 AM why is it shown on tatooine? 2:41:00 PM TKM can solo these. i am one.i just throw intimidate and use head hit to take out the mind. 4:24:00 PM You find these in the Geonosian Lab/Cave on Yavin IV. How well do you think a TKM, CM would stand up to one of these? 4:26:00 PM Yep, it sure is. 10:24:00 PM Isn't this the same creature that's in the Geonosian gladiatorial pit in Episode 2? 10:02:00 AM When me and a guildmate came to this room, it wasnt an overly difficult fight; Master Rifleman/CM, and a TKM/Doctor.. If you get the other creatures to aggro it, it goes pretty quickly. 10:04:00 AM Y is the picture on Tatoine?? 5:50:00 PM I've killed this thing many times now. It can have some really insane loots, or you could get crap (venom) I've even heard someone looted an Interwoven RIS Schem off it. Acklay Bones (best loot) are used to make really good Stun Batons and Power Hammers. 2:37:00 PM Does any of u have some more pictures of this awsome creature? 3:49:00 PM Ahrun like you never have before! 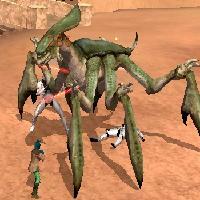 12:15:00 PM Boss creature at the end of the Geonosian Lab. I have never fought it, but I have been able to target it and provide the information listed above.